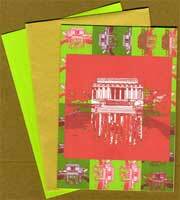 Another take on the Lincoln Memorial - this time in hot holiday hues of red and green. Based on a pen and ink drawing, this image is a cheerful and mod way to send your best holiday greetings. Inside, "Season's Greetings" appears in Liz's handwriting. You also have the option of choosing one of nine other festive greetings (pdf 329k). The back of the card features the following Abraham Lincoln quote in type: "The better part of one's life consists of his friendships." 4 1/2" x 6 1/4" card is printed on heavy white recycled stock and comes with either glamorous gold or electric green envelope. Sets of 8 cards are packaged in kraft box with clear lid.